When it comes to satisfying your rainbow cravings in the garden, few flowers satisfy like the rose. (Even blue? We'll get to that in a moment). Horticulturists are hard at work developing new hues and bicolors, while also bringing us improved vigor in the primary tones we've come to depend on for brilliance in the garden. Whether you like the calm vibe of an all white garden, the contrast of color wheel opposites, or the free-spirited look of a patchwork cottage garden, there's a rose color to suit your needs. Forget about ever paying premium prices for a bouquet of red roses when you can harvest homegrown beauties by the bushel. For perfect-looking red roses with tight buds and long stems, grow hybrid tea roses like 'Mister Lincoln,' 'Veteran's Honor,' or 'Beloved.' In addition to the rich, red color, you will delight in the real rose scent that is lacking in so many florist arrangements. For smaller but more abundant blooms, check out a shrub or ground cover rose like 'Red Drift' or 'Double Knock Out.' 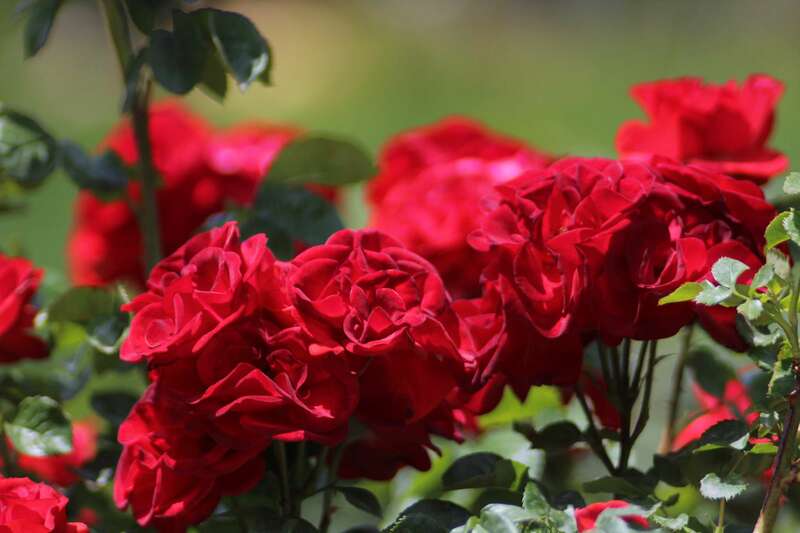 While these roses don't pack quite the same fragrant punch as the big bloom roses, they are very disease resistant and may not even require spraying. Cheerful tangerine and dreamy apricot roses glow in the sunny flower garden, bringing just the right blend of energy and warmth to companion plantings of purple or blue flowers like salvia and Russian sage. If you're troubled by black spot in your area, try the highly resistant Floribunda 'Easy Going,' with clear peach blooms. For the cutting garden, you can't go wrong with 'Wildfire,' a fragrant repeat bloomer. Yellow roses have a bad rep of being black spot magnets, but the disease resistance and vigor of yellows on today's market have come a long way from weak cultivars like Rosa foetida 'Persian Yellow.' Pale lemony blooms like those of the climbing rose 'Lady Banks' will fill your arbor with vigorous canes laden with flowers. 'Graham Thomas' bears large cupped flowers with a rich golden hue throughout the growing season. The trend for green flowers has never been hotter, so get on board with green rose varieties like 'Lemonade,' 'Jade,' and 'Super Green.' Unlike some green flower types, the shades of green you can find in roses are subtle, and usually infused with cream or blush. Green roses infuse a jolt of minty freshness into any flower arrangement. Pale green is a cool complement to lavender or pink flowers, and it adds festive flair to a holiday arrangement with red roses. The quest to develop a true blue rose has taken on sense of increased urgency as breeders occasionally claim a breakthrough in coloration. Although roses do not possess the gene that causes blue petals, researchers are working with advanced genetic manipulation techniques to transfer blue genes from blue flowers like pansies or irises. Results so far have led to violet-blue roses like the Suntory blue rose 'Applause.' The 'Blue Moon' rose is another variety that looks spectacular in catalogs, but is suspiciously lilac in tone in the landscape. Any royal blue roses you might encounter at the florist are the result of artificial dyes. Pink roses comprise a huge tonal range from the fun bubblegum and fuchsia hues to the romance of blush, salmon, and mauve tones. Make your pink rose garden out of the ordinary with an ombré planting. Stagger at least five rose bushes from pale blush to dark pink in the border. A recipe for an ombré pink rose border might look something like this: 'Garden Spirit,' 'Voyage,' 'Aloha,' 'Beverly,' and 'Baronesse.' For a greater effect, keep your pink roses in the same group, for example, David Austin English roses, hybrid tea roses, or floribundas. Deep plummy purple roses like 'Ebb Tide' and 'Twilight Zone' are underused in the garden, yet stand out more than classic red roses. Lately gardeners are buzzing about the merits of 'Plum Perfect,' a Kordes introduction that thrives without spraying. Dark colored roses like purples and burgundies are at their best when they receive some afternoon shade. The direct afternoon sun can cause petal scorching, which leads to blackened edges and curling. Keep in mind that most roses marketed as "blue" are, in fact, purple or violet roses. Similarly, roses labeled as silver are usually in the purple or lilac range. Certain lighting situations or companion plantings may help to highlight the blue or silver tones of purple roses. White roses with pink and cream seem to glow in the garden, making them well-suited for the moon garden. 'Desdemona,' an English musk hybrid, seems to emit a faint pink glow from its highly perfumed flowers. 'Crocus Rose,' a cream-colored introduction from David Austin, will produce its lavishly petaled blooms even in zone 4 gardens with poor soil. Striped and two-toned roses encompass soft blends like the famous 'Peace' rose, blooms with a reverse coloration pattern on each petal like the highly perfumed 'Double Delight,' and magnificent patterned blooms like the picotee 'Betty Boop' or the candy cane stripes of 'Scentimental.' These roses are a garden designer's delight when planted with companions that emphasize one of the predominant colors in the rose blossom. Although bicolor roses are striking and different than single hues, they require no more care than a typical rose. You can grow a rainbow of roses, but is it possible to grow a single rainbow rose? The rainbow rose is a popular trend in the floral industry, but it is a manmade creation, not something straight out of a unicorn's garden. The methods used to create rainbow roses vary, but include professional sprays, dip dyes, and absorption dyes, which add color via uptake through the stem. Rainbow roses are marked up due to extra labor costs, but you can stretch your dollar by adding additional roses and other flowers from your garden to a rainbow rose bouquet.